The Sholk Road Adventures: "Vechnyi Zov"
Well, I have officially spent a week in Ufa. I still feel like I barely know the city, and am looking forward to exploring it this weekend. Classes started this week -- they are pretty exhausting. The days are hot and long, as the sun rises at 5 am and sets at 11 or 12 in the evening. And I'm always speaking Russian, in accordance with the language pledge. In fact, when I went on facebook and saw "DOMA," my initial reaction was "why is everyone posting the Russian word for 'house'?" And then I realized the entire social media universe was reacting to the SCOTUS decision. 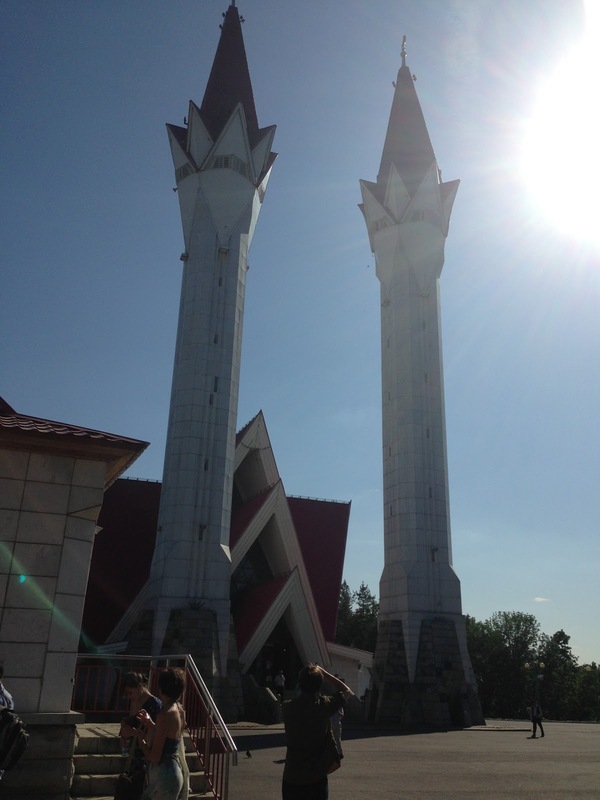 For our weekly excursion, we visited the "Tulip Mosque," one of the city's largest mosques that can hold up to 500 people. While I have studied Islamic ideology at Georgetown and have previously visited Yasawi's mausoleum in Turkestan, prior to Tuesday, I had never been to a practicing mosque. It was really interesting to see some people in prayer and listen to one of the clergy leaders (I am not sure if he was a mullah or a different position), but I enjoyed listening to him explain Islam in Bashkortostan and the history of the region's Islamic population. I have spent quite a bit of time with Liobov this past week, and I must say, she is really fantastic. She is a university professor and a true academic through and through, spending her free time editing students' papers and grading. I love listening to her stories from the Soviet Union and travels throughout Russia and Central Asia (more to come in the future). But for now, I have to share a video she made with some other professors. A few years ago, Liobov and some of her friends made a "behind the scenes" documentary of the Soviet film, "Vechnyi Zov," which was filmed in Bashkortostan. They contacted the director and actors in the film and visited the sites where the film was shot -- and posted the documentary on Youtube! It is only in Russian, but check it out (two parts)! It's pretty neat actually. Alas, more details to come, once I fully overcome jetlag. Poka!